Police: Suspect In New Orleans Airport Attack Was Armed With Molotov Cocktails : The Two-Way A former taxi driver attacked two TSA agents with wasp spray and a large blade before a sheriff's deputy shot him three times, authorities say. Police say the man has since died, the AP reports. The ramp to departures is blocked by emergency vehicles at the New Orleans International Airport on Friday night in Kenner, La. The man police say attacked TSA agents with a machete and insecticide spray at the New Orleans Airport also carried a bag of Molotov cocktails and had mental health issues, authorities say. The man was shot three times. Police say he has since died, The Associated Press reports. In the attack late Friday, the assailant approached a security checkpoint at Louis Armstrong International Airport and began spraying TSA agents and passengers with bug spray before drawing a machete from his waistband. Speaking at an afternoon news conference, Jefferson Parish Sheriff Newell Normand said at the time of the attack, no one noticed that the suspect, identified as former taxi driver Richard White, 62, was also carrying a bag that smelled of gas. "What the bag revealed was six half-pint Mason jars with cloth wicks into a liquid that we now know to be gasoline," Normand said, adding, "What you would commonly refer to as a Molotov cocktail." Chemicals determined to have come from firework-like smoke bombs were also found, he said. Normand said White, who underwent surgery Friday night, was "unconscious" at the time of the conference. There is "a mental illness component" to the incident, he said, but "we don't know how severe. "We hope to talk to him. We don't know if that's going to happen," Normand said. Later in the evening, police said the man had died, reports the AP. "No one at this time has any notion as to what may have triggered this behavior," he said. "And, not unlike dealing with the mentally ill, sometimes you will never know." Police say White was shot three times by Jefferson Parish Sheriff's Office Lt. Heather Slyve, who was stationed at the checkpoint. Normand said that contrary to some earlier reports in the media, no travelers were hit by gunfire. 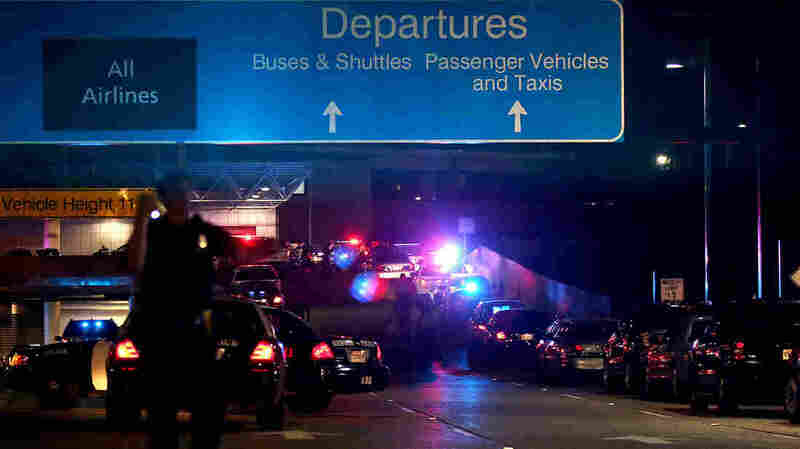 An unarmed TSA officer, identified by the AP as Carol Richel, was wounded in the attack. Speaking at the news conference, she said she was trained for situations like the one that occurred. "When this started happening, it was second nature. We have to keep the passengers safe and we told them, 'Run, run,' " she said. "Officer Slyve is my hero. She probably saved my life, because he was within inches of whacking me. ... She saved a lot of people's lives. This man was swinging very hard with the machete," the TSA agent said. Normand said White's family had been extremely cooperative and that as a result, police took the unusual step of allowing them to visit him in the hospital.